Come hunt a trophy moose in the Big Horn Mountains of Wyoming. 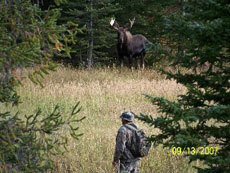 This area is not hunted 95% of the year and we know the habits of moose and can help you find them. Book this hunt for a once in a lifetime trophy moose hunt.